I came here with my son - his first introduction to hostels and it was a great one. It's an excellent facility, well run, large and colorful with art on the walls and interesting layouts. The room is small but clean and comfortable. Ideal for us since we weren't spending much time here. Best HI I’ve ever been in , like the furniture and the design .. it’s really pretty cool. The location is also nice, right in the middle of party and bar area. 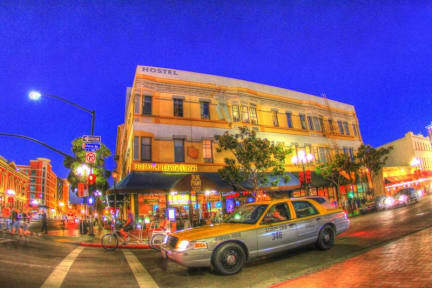 Great hostel with a plentiful bagel breakfast, great location downtown in the Gaslamp Quarter (without being too loud). You can even pick up a recycled transit card from them if you don't want to buy one. My only criticism is that people tended not to interact much with each other and I think that's due to the way the common room is set up. Lots of small/individual tables rather than something bigger and more communal. HI SANDIEGOwas a great place to stay and I met some lovely people. The room was clean and I thought the bed was very comfortable! The staff was awesome too. Over all it was a good experience and a great place to stay. Very clean facilities and pretty comfortable beds and pillows. Friendly and helpful staff. As many others have noted, the location is convenient to food, bars, and public transit. It is also extremely loud (and they told me I was in the quietest available room), so plan to wear earplugs. Room and bathroom were sparkling clean and the front desk staff were very friendly. The location in the Gaslamp Quarter is great, in walking distance of many restaurants and shops, but there is no free parking near the hostel. Free breakfast was nice and I enjoyed drinking my coffee and admiring the lovely view of the city from the kitchen. Everything here was great, but our room smelled of cigarette smoke pretty heavily. You stopped noticing it after 20 minutes or so in the room (when falling aslee), but got “used to it” after that. Not ideal, but the rest of the space was great. Great location! Only downside is noise from the club nearby and rooms not soundproof at all. But the front desk hands out ear plugs if needed. Had a private room and it was great value in a pricey city. Good location and friendly staff but the 4-bed dorm was too small, no convenient sockets or lamps by the bunks, plus the bathrooms need updating.